Mexico is the northernmost nation of Latin America and occupies a land area about three times the size of Texas. The climate varies from tropical to desert, and the terrain includes low coastal plains, high plateaus and rugged mountains. The population exceeds 103 million (2002 est.) with the mestizos (Spanish-Amerindian ancestry) accounting for about 60% of the total. Spanish is the official and dominant language, but Nahuatl (Aztec) and Mayan are still spoken in some rural areas. Roman Catholicism is the religious choice of over 90% of the inhabitants. Present-day Mexico was home to two historic empires. The Mayans (c. 1800 BC - 1100 AD) developed a great ceremonial center at Chichén Itzá in Yucatán, but their influence faded due to natural disasters and extensive warfare. The Aztecs (c. 1100 - 1520) created a thriving state in central Mexico and are remembered for advances in agriculture and astronomy. The coming of Hernán Cortés in 1519 ushered in nearly three centuries of brutal Spanish colonial exploitation. Mexican independence was achieved in 1810, but the nation later lost about one-half of its territory to the United States as a result of the Mexican War (1846-48). The Mexican economy is supported by agriculture, petroleum, mining, steel, textiles and tourism. 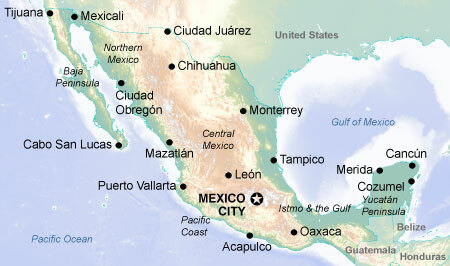 Popular destinations include Cancun on the Gulf coast, Acapulco and Puerto Vallarta on the Pacific and Oaxaca and Guadalajara in the interior. Major civic holidays include Constitution Day (February 5), the birthday of Benito Juárez (March 21) and Independence Day (September 16). Cinco de Mayo is a regional holiday confined largely to the state of Puebla.